A fine blend of elegant pieces mixed with relaxed and casual accents. Eye-catching fabrics and fixtures alongside simple, unadorned furniture. The mixture of ease with formal elements for the chic edge. Similar to Cottage Style, but more simplified and eclectic. Country Chic is my personal design style of choice. 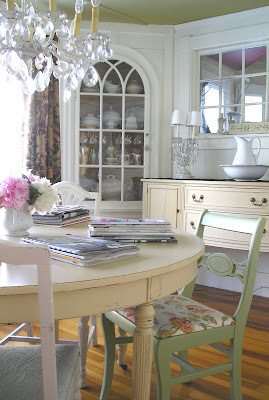 My best personal example is my dining room, which I use as the visual for this article. It has symmetry mixed with a little whimsy to create a relaxed feeling. The elements of the room are formal: crystal chandelier and lamps, fine china and serving pieces. Yet the twist comes through placing those items with lightly distressed furniture pieces. The furniture is not a set. It is a mixture of pieces painted the same color for structure and mis-matched formal chairs painted and distressed to invite guests to sit. In my case, my dining room is my favorite room, yet the one that is least used. To remedy that, I brought in a collection of books and current magazines and placed them in neat and orderly piles. This has created a comfortable and attractive spot for me to take a seat and catch up on my reading, clip articles and enjoy a cup of coffee. I am now able to use the room in an entirely new way yet still display some of my favorite "special" pieces. In the end, Country Chic is a wonderful choice for those who love elegance but live in casual comfort. I encourage you to rethink your dining room and your elegant pieces. Dining rooms and fine china should be used. Make them part of your everyday lifestyle.